Add the eggs, one by one, along with the lemon zest and almond essence, whisking the mixture well after each egg. Don’t worry if this looks a bit curdled. Unroll one of the puff pastry rounds (leave it to cook on the baking paper that it is wrapped in) onto a baking sheet, using a brush or your fingers, moisten a 1cm band around the edge of the pastry with the egg wash to act as ‘glue’ for the top layer. Pour the almond mix into the middle and spread out evenly – but again 3cm away from the edge. place the ‘feve’* into the mix. Brush the top with the beaten egg and then lightly score a pattern in the top. Remove from oven and leave to rest for at least 10 minutes. Use the paper to slide it onto your serving plate. If you have managed to seal the edges without any mix oozing out, then you should be able to slide the paper out from underneath – otherwise you might need to cut it away and try not to eat the paper when you serve! 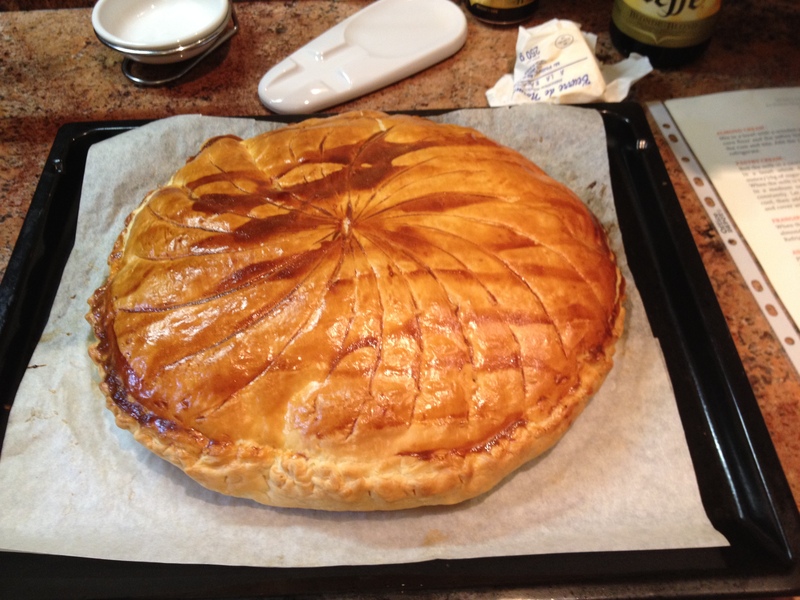 * If you don’t have a feve at home from a previously consumed Galette, you can buy them in the boulangerie. Don’t forget to ask for the crown when you buy the feve.